628 pages | 32 B/W Illus. This handbook analyzes the main issues in the field of hospitality marketing by focusing on past, present and future challenges and trends from a multidisciplinary global perspective. The book uniquely combines both theoretical and practical approaches in debating some of the most important marketing issues faced by the hospitality industry. Parts I and II define and examine the main hospitality marketing concepts and methodologies. Part III offers a comprehensive review of the development of hospitality marketing over the years. The remaining parts (IV–IX) address key cutting-edge marketing issues such as innovation in hospitality, sustainability, social media, peer-to-peer applications, Web 3.0 etc. in a wide variety of hospitality settings. In addition, this book provides a platform for debate and critical evaluation that enables the reader to learn from the industry’s past mistakes as well as future opportunities. The handbook is international in its constitution as it attempts to examine marketing issues, challenges and trends globally, drawing on the knowledge of experts from around the world. Because of the nature of hospitality, which often makes it inseparable from other industries such as tourism, events, sports and even retail, the book has a multidisciplinary approach that will appeal to these disciplines as well as others including management, human resources, technology, consumer behavior and anthropology. This comprehensive book contains chapters from leading researchers that make a unique contribution to the field. Contributors draw on a wide range of disciplinary perspectives and paradigms to explain hospitality concepts. 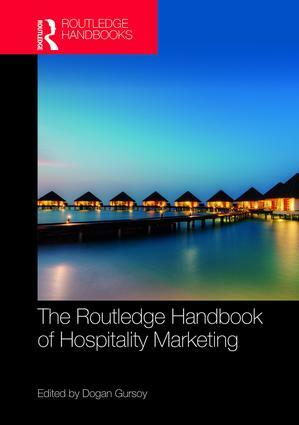 This handbook serves as an invaluable resource for understanding the theoretical and practical aspects of hospitality marketing and is useful to undergraduate and postgraduate students conducting research in the field as well as practitioners. Robin Nunkoo, Associate Professor, University of Mauritius. Chapter 46: An overview of trends and challenges in the hospitality industry. Dogan Gursoy is the Taco Bell Distinguished Professor in the School of Hospitality Business Management at Washington State University, USA and the Editor-in-Chief of the Journal of Hospitality Marketing & Management. His research has been published broadly in refereed Tier I journals such as Annals of Tourism Research, Journal of Travel Research, Tourism Management, International Journal of Hospitality Management and Journal of Hospitality & Tourism Research. He has also developed and designed the "Hotel Business Management Training Simulation" (www.hotelsimulation.com), a virtual management training game where participants are divided into teams and assigned the task of running 500-room hotels in a competitive virtual marketplace.